Adobe's new UX tool is for creating experiences and, unlike others, is an experience in elegant UX in and of itself. 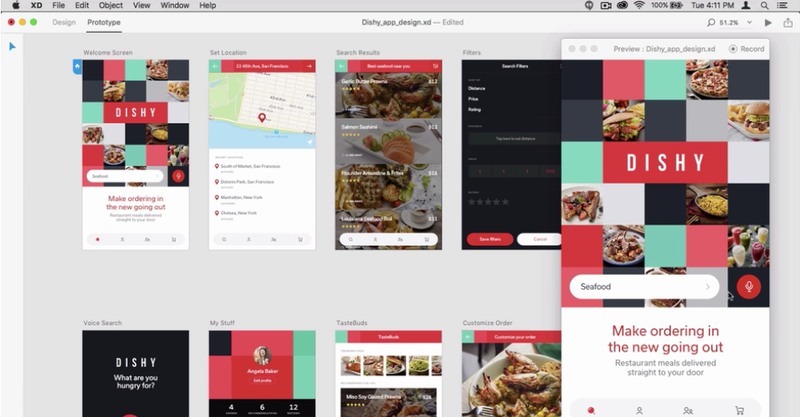 Adobe has long created software that aimed to help designers and developers create better app and web experiences. Adobe Experience Design CC (Adobe) is probably one of the first tools that enable better UX design by setting an example. If history shows us anything, it's that Adobe creates products in this category—albeit loosely defined—with rapidity. Muse and Dreamweaver are two current tools meant for web design, although they approach it differently. In the same category is the now retired Fireworks, whose prototyping qualities overlapped with those of first two. The also-recently-retired Edge family was rather more developer-centric. For all this, Adobe didn't quite strike the right balance of code and design input methods vs. output formats. All of the above tools emphasize, on one hand, pure coding, or on the other, pure prototyping. The same pattern holds true when it comes to generating usable output, which could again mean either cleaner and saner (maybe even human-readable) code, or prototypes that demonstrate the what the user should receive. Experience Design is unique in that in brings the workflow and the process of prototyping closer together. In this, Adobe hasn't tried to strike a balance, it's tried to refine a focus. Experience Design won't be something you use for development activities, but it is something that more UX designers may use to convey the intent of their designs: Experience Designer takes raw files like PNG, JPEG, SVG, etc that have been authored in PS or AI, and helps the designer transform them from a collection of assets into a near-production quality interactive prototype.